There were three Wesham runners in the Chester Marathon on Sunday which also included the England Athletics vs Celtic Nations Masters International and the British Masters Championships on a fresh but fine day with a cold frosty start but that was warmer and windier by lunchtime. With a 9-am start Lee Mangan was away and he finished 1924th overall; 1509th male and 309th M40 in a time of 4:22:59 (chip time 4:19:30) having passed through 20k (12.4 miles) in 1:58:32 and keeping to a fairly even pace. 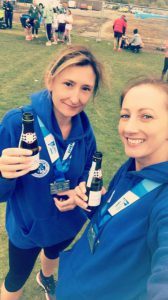 Tanya Shaw and Jo McCaffery finished together as 551st and 552nd women in 4:41:00, and 2245th and 2246th overall. They placed 114th and 115th W40s in a great shared experience. Carmel Sullivan finished 9th woman and 1st W50 in the Rochdale Half Marathon on Sunday in 1:37:06 placing 76th overall on an undulating route but good conditions for running with 403 competitors. Daniel Shaw ran in the Rivington Half Marathon, off-road alongside Anglesarke, finishing 6th in 1:33:33, an excellent result. Paul Lancashire ran the Congleton Half Marathon coming across the line in 111th place with a time of 1:38:24. There were 404 finishes in this popular race on an undulating route featuring an out-and back stretch and a single large loop along quiet country roads. Steve Abbott had finished 2nd in the 315 Cancer Care 5k in Lancaster last week running 18:45. In the West Coast Half Marathon finishing in Lytham Mark Renshall finished 18th in 1:34:09 and 5th M45. Helen Lawrenson was 4th woman and 2nd W45 in 1:38:42 running with ex-Wesham member Nicola Unsworth with the pair neck-and neck for the finish. Steve Littler ran the fastest time of the day at the Fleetwood Promenade run, his second parkrun and second time as fastest runner, clocking 17:09 and an M45 grade of 82.70%. David Taylor had the third fastest time of the day with his debut run here and 181 parkruns with 18:22 for senior 70.60%. Peter Cruse ran 20:43 for M55 74.82% and Dave Young ran an M70 68.30% with his time of 25:49. Brian Jones ran 31:53 for M55 49.03%. John Burns was the first Wesham finisher in the Lytham Hall parkrun clocking 22:00 for an M60 age graded percentage of 74.85%. Martin Allison ran 22:24 for M35 58.85% and Graham Cunliffe scored a new personal best with a cracking time of 23:47 for an M60 grade of 68.61%. Phil Leaver was close behind with M65 69.86% with a time of 24:00. Stephen Twist ran 25:12 for M50 58.99% with Antoinette Holton running 29:27 for a senior woman grade of 50.59%. Sharlan Butcher ran 30:55 for W45 grade 51.37%. Steve Abbott ran 20:47 at the Preston parkrun in M40 66.16%; Robert Brown clocked 25:59 for M60 62.28% and Paul Carter had a time of 27:43 for M45 grade 52.38%. Chris Pike was back at the St Helens run to clock 25:00 for M40 55.87% his 118th run here and 144th overall. George Kennedy was still in Glasgow and took in the Victoria Park run where he came in with a great 21:01 for an M60 grade of 77.00%. James Mulvany had the fastest time of the day at the Fell Foot run, completing the lap course in 17:52 for M40 76.40%. Wesham had a good turnout at the Haigh Woodland run as it was featured in the club’s trail running championships. Paul Gregory was the fastest with a swift 19:04 over the hilly course to grab an M40 age grade of 71.59%. Steven Gore ran 19:54 for an M35 grade of 67.09% and Nigel Shepherd dashed 20:32 for M60 78.08%. James Danson ran 25:03 for M50 60.36% and Vicky Gore 26:19 for W40 58.90%. Kerry Eccles had a good run with 28:32 for W55 63.43% and Megan Gore ran 25:09 for JW11 47.32%. In the Blackpool run in Stanley Park Lee Barlow ran the 5th fastest time of the morning in a breezy 19:03 before heading off to Palma with the club and friends, scoring an M45 grade 74.98%. Elliot Costello ran 22:12 for a senior 58.11%; Jonathan Sanderson 22:39 for 56.95%; and Dave Marsland an M60 grade of 71.36% with a time of 22:52. Stephen Browne ran 22:59 for M50 65.19% with Martin Bates recording M60 65.61% timing 24:40. Suzanne Leonard ran 24:49 for W45 65.95% and Finlay McCalman 27:41 with M50 55.03%.